On May 6, quite a storm was unleashed in south central Nebraska. Soybeans that had been planted two to three days before the storm seem to have emerged fine, while those planted May 5-6 tend to have uneven emergence and crusting. This is occurring regardless of tillage type, residue cover, etc. Many farmers have been running pivots to help the soybeans break through the ½- to 2-inch crust, often applying an inch of water before they see stand improvements. UNL on-farm research has shown less than 1.4-2.0 bu/ac yield difference between planting 90,000 and 180,000 seeds/acre. (See report.) In our research, 90% of the planted stand was achieved at both seeding rates in irrigated 30-inch rows in no-till and ridge-till fields. Consider what was found in 2006 in one dryland field in Nuckolls County where populations of 100,000, 130,000, and 160,000 seeds/acre were planted. This field was at the cotyledon stage when it was hailed. Some plant stands dropped to 67,000. Yield was 4 bu/ac less than in the 160,000 seed/acre planting that had a final stand of nearly 98,000. The average yield in the field was 40 bu/ac. While this is only one field and one year of research, it is an example of how soybean plants can compensate for reduced populations by branching and how August rains in dryland can still allow reasonable yields to be produced. UNL research conducted by Dr. Jim Specht, UNL Soybean Physiologist, also has shown that for every day planting is delayed after May 1, there is the potential to lose 1/4 to 5/8 bushel per day. As we near the end of May and early June and consider that late planting yield penalty and the dry soil conditions (particularly in dryland fields), along with the seeding rate results from this UNL on-farm research, we are recommending that growers leave stands in many fields. Based on our on-farm research, leaving dryland stands of at least 65,000 plants/acre and irrigated stands of 90,000 plants/acre is likely a better choice than replanting. We realize that there are some larger gaps in various rows in the field, and while we don’t like to see that, the gaps are disappearing as plants continue to grow and branch out. Keep in mind that a gap in one plant row will be compensated by plants in the adjacent flanking rows. They will form extra branches to take advantage of the sunlight, thus single-row gaps may not be as yield-reducing as you might think — especially in 15-inch row spacings. We’re also seeing how resilient soybeans are. 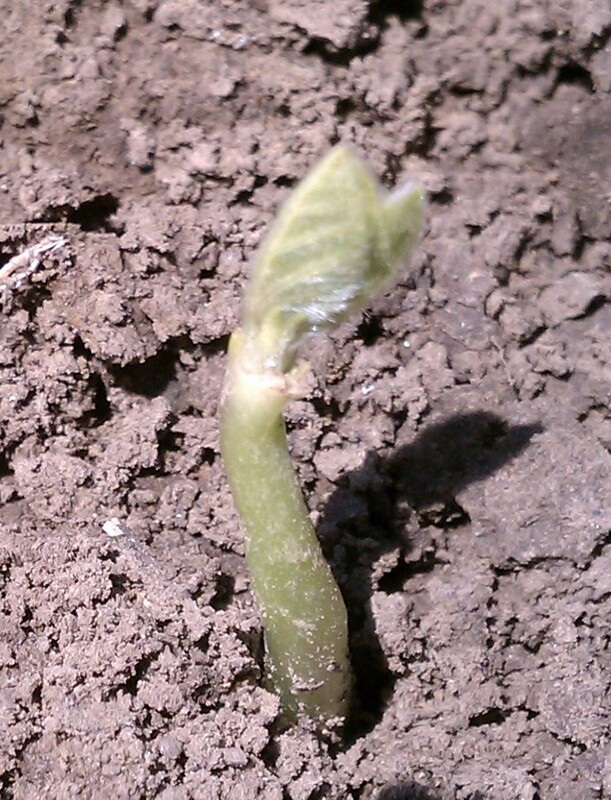 Some soybeans have been in the ground for two weeks and in many cases, are fairly healthy below the crust. Soybean seedlings emerge by pulling (not pushing) their cotyledons upward. The seedlings rely on the cotyledons as a reserve source of carbohydrate, protein, and lipid to support early seedling development until leaflets open for photosynthesis. When a seedling tries to pull its cotyledons through a crack in the crust, the crack may be too small and the cotyledons may be stripped off. The plumule, which is the seedling stem tip and its undeveloped leaves above the cotyledonary node, may remain, but without the cotyledons to serve as a carbon and nitrogen source, development of new seedlings with small leaflets will be slow. These plants may not become competitive with surrounding plants in terms of pod and seed production. Therefore, when counting seedlings to determine plant stand after a soil crusting event, count only the seedlings that have at least one cotyledon. You can count seedlings missing cotyledons if they have large unifoliolate leaves that will soon unroll such as the picture on this page. Recommendation: When deciding whether to replant your field, consider UNL research findings that showed a minimal yield difference between stands of 90,000 and 180,000 seeds/acre. We recommend leaving irrigated soybean plant stands of 90,000 or more and dryland plant stands of 65,000 or more. Uniformity of plant stands is also important, but “patch” planting may be used to deal with local areas of low plant stands. For more information on reduced soybean planting rates, see the April 20, 2012 CropWatch story, Drop Soybean Seeding Rate and Save $10-$18 per Acre. Posted on May 19, 2012, in Crop Updates and tagged Agriculture, Crops, Extension, farm, farming, Irrigation, Nebraska, plant stands, Plants, replant, soil crusting, Soybeans, stand counts. Bookmark the permalink. 2 Comments. I’m sure they unfortunately do!